What does 2019 hold for global cooperation? Though belief in globalism – a top-down conspiracy to impose an international system that trumps national sovereignty – may be dead, globalization is alive and well. An effective and resilient international order, comprising strong nation-states, thus remains essential. Will global cooperation finally emerge from the doldrums in 2019? The international community’s recent agreement on a “rulebook” for implementing the Paris climate agreement seems to offer some hope. But opinion polls suggest that many remain concerned that a global economic recession or major geopolitical crisis will test the international system’s resilience. And it is not at all clear that the system will pass. But perspectives that refute this narrative seem to be gaining ground. Many world leaders believe that the Western countries squandered their influence over the international system by intervening politically and militarily in the affairs of others without any clear endgame. Some also argue that the global elite has only pretended to pursue socioeconomic change, while actually maintaining a status quo that has benefited them. Many believe that now, however, the vertical hierarchies that have long sustained the global order are being disrupted by the growing political and economic influence of horizontal networks. Even the United States, it is often claimed, has moved from supporting the multilateral system to undermining it. But, though belief in globalism – a top-down conspiracy to impose an international system that trumps national sovereignty – may be dead, globalization is alive and well. As the historian Yuval Harari put it in his book Sapiens, history continues to move “slowly in the direction of global unity.” An effective and resilient international order, comprising strong nation-states, thus remains essential. World leaders do not question the need for such an order. Rather, the major political challenge to global cooperation lies in managing our diversified and pluralistic world within the established institutional architecture, while overcoming the tendency among some to associate any effort to shape globalization with globalism, internationalism, or imperialism. What would it take to build a more resilient system, capable of withstanding sudden shocks while maintaining its core functions? The answer is not cut and dried. While there has been important recent research into what makes a person resilient, there is no clear overarching explanation of what makes a resilient country or international system. Third, sharply rising inequality has made economic inclusion and equity a priority for many voters. This will shape national politics for the foreseeable future, and thus help to determine the fate of the current liberal order. Figuring out how best to influence the course of globalization will not be easy. But here, too, humans seem to have a natural inclination. Indeed, many scientists now believe that thinking about the future is humans’ defining characteristic, and argue that “looking into the future, consciously and unconsciously, is a central function of our large brain,” and that planning for it results in less stress – and more happiness. 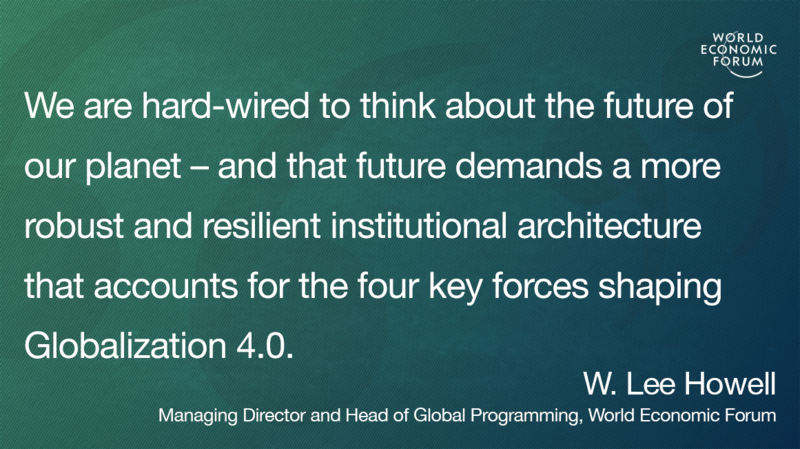 We are hard-wired to think about the future of our planet – and that future demands a more robust and resilient institutional architecture that accounts for the four key forces shaping Globalization 4.0. We should get to work on building it.